Taipei, June 3 (CNA) President Ma Ying-jeou (馬英九) said Wednesday that his South China Sea Peace Initiative is "probably the only way to downsize the problem" in a region with tensions rising over territorial claims, and that a roadmap will be announced soon. The situation in the South China Sea is more complicated than that of the East China Sea, but it is clear that "the competition of territorial claims will lead nowhere," Ma said during a question-and-answer session of a video conference with Stanford University. In response to questions on his South China Sea proposal, Ma said that the initiative is based on the idea that "while national sovereignty cannot be divided or compromised, natural resources can be shared." "This is probably the only way to downsize the problem" and seek a solution, he added. Asked if Taiwan had discussed with China and other claimants before the proposal was made May 26, Ma said "before we propose the South China Sea Peace Initiative, obviously we will let our friends know in advance what we will be doing." He described it as an important step toward hoping to achieve the results Taiwan did with the East China Sea Peace Initiative. In addition to the ideas of peace and reducing tensions, Ma said, his administration will announce a roadmap for the South China Sea peace proposal in the near future. Ma's South China Sea Peace Initiative followed a similar approach proposed by him in August 2012 for the East China Sea, also a disputed area. Taiwan and Japan were able to sign a fishery agreement in 2013 to address fishing disputes in waters surrounding the disputed Diaoyutai Islands after the East China Sea Peace Initiative -- which calls for shelving disputes and seeking joint development of resources -- was proposed. The Diaoyutais are claimed by Taiwan, Japan and China. Ma's East China Sea initiative proposes three separate sets of bilateral talks before combined trilateral negotiations can be conducted. Drawing from his experience with the East China Sea dispute, Ma is seeking to apply that model to the South China Sea. But he admitted that the case in the South China Sea is more complicated, because there are more claimants and it covers a larger area. "So we need to be more patient," he said. 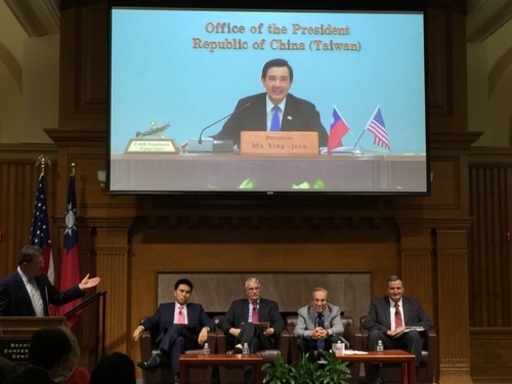 The president also cited the example of Taiwan and the Philippines trying to resolve fishing disputes in their overlapping economic waters, following a shooting death of a Taiwanese fisherman by Philippine Coast Guard personnel in May 2013 in an area where the two countries' exclusive economic zones overlap. "We try to settle disputes with peaceful means," Ma said, while expressing hope that arrangements could also be made for other parts of the South China Sea. Ma's South China Sea Peace Initiative calls for the parties concerned to shelve their disputes, pursue peace and reciprocity, and encourage joint exploration and development, in an effort to maintain regional peace and promote regional development. Several countries, including Brunei, Malaysia, the Philippines, Taiwan, China and Vietnam, claim all or parts of the South China Sea. China has sparked tensions in the region in recent months by unilaterally reclaiming islands in the South China Sea and using them to establish military facilities.